this place oozes nostalgia, right down to a still-working legacy coin-phone… dont see many of this device around nowadays. no reason not to call when the cell battery is flat. our regular hang-out place to have a drink and catch some football action!! 4f: when? got met hunk there or not? yo, u so bz ka? The Yard, seems a good place, so this is where you go dating!!! 4f: sshhh…. not so loud! 4f: call me when you are in the vicinity!! post note: SA, i guess fyre answered your query. he is a regular at the pub and know the owner personally. 4f: considering a take-over soon. wanna buy some share? 4f: will bring you there on your next trip in lil dot!! 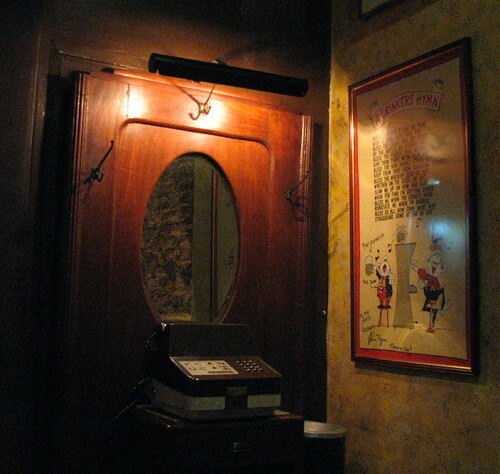 4f: according to fyre comment here, it is the only surviving english pub. guess pubbing the english way is not in vogue. 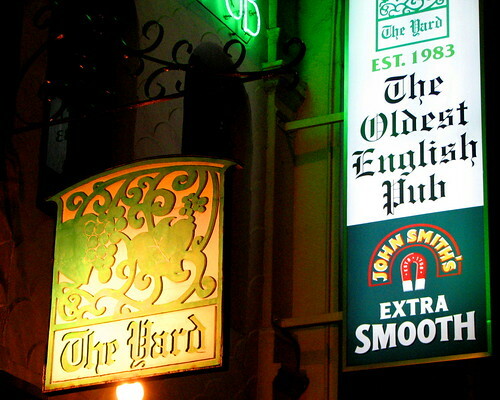 it should be the oldest surviving English pub in Singapore — emphasize SURVIVING. any way a little bit of history — the place used to be hangout for Singapore journalists, back in the days when the heart of Singapore journalism was at Times House along Kim Seng Road. Now, they are building a condo on the site. Still, some of us “old birds” still hang out there or nostalgia’s sake. wat can I say — the place is cosy, the liquor is affordable and the staff is familiar……..well at least the owner is. Some of us actually learnt how to drink there. 4f: thanks for the clarification!! the yard must had started off around the same time as “frontpage”, another frequent haunt of journalists in the same vicinity. only different “frontpage” is long gone now. sorry….the person that started frontpage used to be a regular at the Yard, he started his own place much later. sshhh…justice y, “the man around town” knows how to enjoy his drinks & …..! do not need lessons hor! errr auntie actually i didn’t know wat a whisky soda was until the yard and a certain ravi shankar. am sure u remember those days with much fondness. btw who is this fyre guy anyway? someone we know? I thought the oldest English pub has always been the Tiger’s Tavern at Raffles Hotel no? huh?….i thought it was you doing me a favour! 4f: tenkiu2! no prob, late is better than never. long time not meeting u for a cuppa, or a ‘ting’ cheers!~ hahaha….find time for it k? The Yard, how bout it? 4f: good, can arrange a yum seng session at the yard! Now U also Professional blogger doing advertisement ah? How much? 4f: i am happy i can still blog abt commercial entity without being spammed. no monetary reward here but i am just happy being acknowledged! err what about the Long Bar? Thats gotta be older than The Yard…. No?